VFD86F-LAN is the small display unit which connects with the Ethernet(10/100Base-T) network directly and performs a message and a Japanese (Kanji) character display. 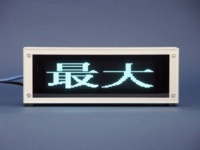 It's good for Real Time changeable Signs, Moving message from network PC. High quality DOT matrix for indoor use. In the information display and guidance display in the interior of a room, it is the optimal. It is a display soft touch to those who work around. *1 VFD (Vacuum Fluorescent Display): A fluorescent character display tube is a high-class display device, It is used in many applications, such as Audio & Video equipments, such as a VCR and a Stereo, and a Alarm Clock, Car equipment. etc. Large size Message on a small body. 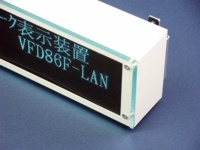 VFD86F-LAN can be displayed to the maximum character whose one character is 41mm by 83mm. Since the font size is indicated by mixture, information can be displayed legible. 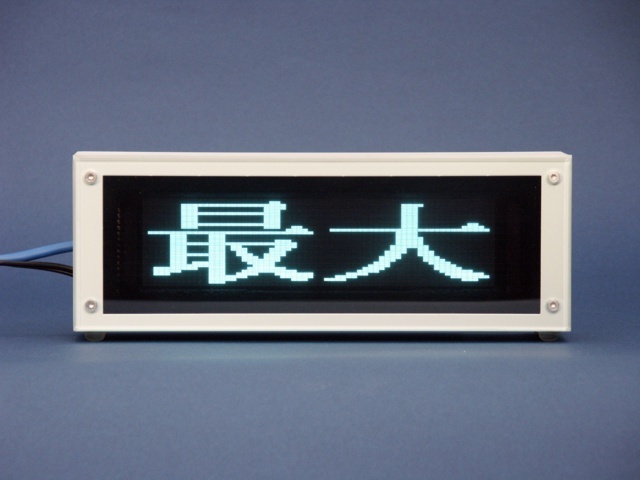 length and each width -- expansion character display (a 32-dot font is vertical 2 double-width) by 2 double-width and 4 double-width. The simple and beautiful design which does not interfere with a display. A front acrylics panel serves as a beautiful accent line with the angle to see. 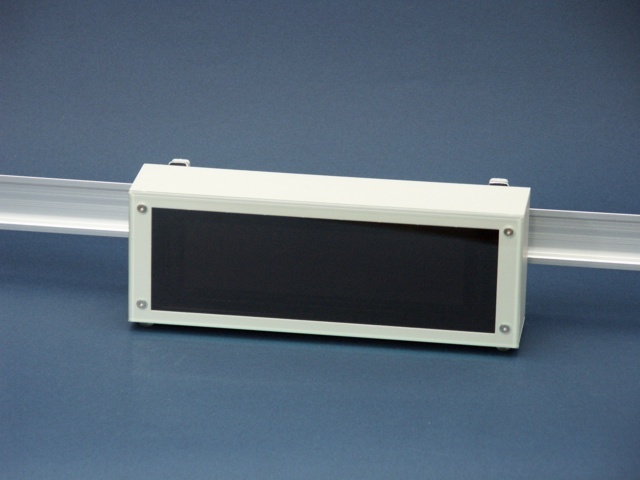 A wall mounted, a DIN rail, etc. can be installed. The putting installation with the attached rubber foot and the wall mounting with the optional wall fittings can be set up. 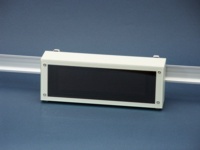 It is possible to set it up in various places such as shelves of the wall of the entrance of the conference room and the classroom, windows, and waiting rooms, stores, and warehouses. It is possible to correspond also to the line and the arrangement union changing flexibly. 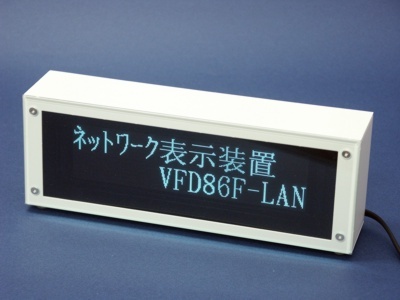 Display software (DispVFD) can allocate the button the display message. 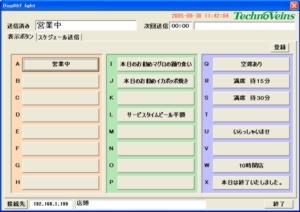 Transmission software (SendVFD) : from customer's program and application easily.